–IN a previous post, I mentioned that I avoided plein air painting for three years. When I returned to the practice last summer, I was able to paint without inhibition at a much higher level of expertise. The transformation intrigued me because according to books like Outliers progress is achieved only with years of deliberate practice. Due to the positive leap forward, which included two years painting abstractions, I wanted to understand and replicate the process. In my search for answers, I found the book Reductionism in Art and Brain Science. The author, Nobel Prize-winning neuroscientist Eric Kandel, explores how reductionism—the distillation of large concepts into smaller, more tractable ideas—is used by scientists and artists to pursue their respective truths. He explores explicitly how abstract art can stimulate the brain causing unexpected creative connections. Although I have yet to finish the book, it promises to explain my unexpected improvement. After mounting two shows with a total of 38 landscape paintings, I found I not only needed a break, I also had a strong urge to trigger a similar transformation. Due to a recent and serendipitous encounter with graffiti art, I settled on painting with acrylic markers as the focus of my experimentation. 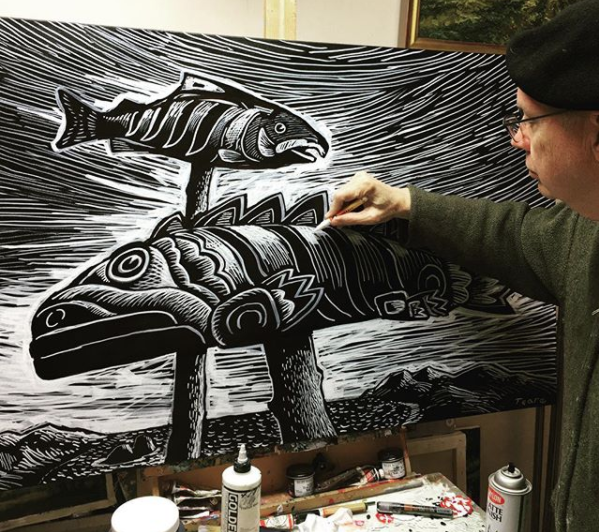 The technique resembles my scratchboard work as well as my woodcuts, only much larger. I showed preliminary efforts to one of my galleries and we scheduled a show for May 2018. Although I'm pleased with my recent landscape progress, it isn't enough. In today's competitive environment it isn't sufficient to be one of the best painters in your genre–you have to be the ONLY painter in your genre. In other words, you have to be the only practitioner of an inimitable style. Explorations with marker painting might provide the final transformation. Do I intend to paint this way from now on? Like my foray into abstraction, I plan to use the process to transform my landscape painting. How it will do so is anyone's guess. But I look forward to the results. I will give a full review of Reductionism in Art and Brain Science as soon as I finish it. If you want to follow my marker painting progress, please follow my Instagram account here. Above: Cryptographica, 24" x 48", available from Alpine Art. Charlie Rose interviews Eric Kandel - 20 minute video. Great ideas to stimulate creative thinking. Thanks. That's a great video! I added it to the link to Kandel. Rose interrupted Kandel at several crucial spots where I wish he would have been allowed to elaborate more. But nevertheless a great interview. Thanks for the link!